A new book in South Africa says a computer hacker tried to sabotage the historic election in 1994. This was the vote which ended apartheid and brought Nelson Mandela to power. The book by Peter Harris, who was the head of the official election monitoring division, says the hacker got into what was thought to be an impregnable system. The manipulation was detected at the time, but the culprit was never discovered. It is easy to forget just how tense South Africa was ahead of its first truly democratic election in 1994. There were threats from the far right and plots by sections of the white military to disrupt the vote. Peter Harris was head of the official election monitors. "There was a right-wing conspiracy to start an armed insurrection with the help of the Defence Force," he says, "and that resulted in a number of bombs going off to try and stop the election and cause mass panic and despair." The April election went ahead as scheduled. Votes were counted and the results began trickling out. But Peter Harris says at 0500 on 3 May, a hacker managed to get into the Election Commission computer. The hacker boosted the votes of three right-wing parties, shaving votes off the ANC's tally. But a computer specialist seconded from the United Nations detected what was going on, and the whole system had to be brought to a halt. "The electronic count was compromised by a hacker who went in and multiplied the vote," said Mr Harris. "The electronic count was then closed down. It stopped. That's when the results stopped going to South Africa and the rest of the world." The secret manual system saved the day. But it required suspending the announcement of the results for two days. The author says because the manual count was running two days behind, it had to catch up. Many in the ANC feared that the delay was because the vote was being rigged against them. Not so, says Peter Harris: "The ultimate result was true and fair." 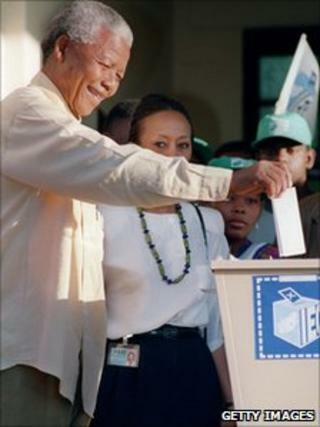 It was being delayed only to ensure that an accurate vote count took place and Nelson Mandela's party could be declared the undisputed winners of the election.